The first time we visited the Giant's Causeway, we knew we would want to return again (and again). We've been back almost a dozen times and every time we're amazed at the (mostly) hexagonal stones jutting majestically from the water's edge. No wonder it's famous the world over. Yes, first you have to get here. There is a map at the bottom of this page, and also a link to Google Maps so you can find your way from wherever you are, right to it. But once you park, you'll have to walk (or take a bus) down from the Visitors Centre along the coast, eastward. Dogs can come with you, but must be kept on a leash at all times. Walking around the first headland, still on a wide well sealed path, you'll see the Giant's Causeway in the distance. It's a good walk. Lots of fresh air. It is quite an easy, consistent slope down to the level of the Causeway. But, I recommend taking the bus back up. Alternatively you can walk east from the Visitors Centre along the TOP of the cliffside and descent (quite steeply) down a stairwell in the mountainside, bringing you out beyond the Causeway. You get a bird's eye view of the coast from here and it really is breath-taking and worth the effort! The new architecturally designed bespoke Visitors Centre is fabulous. Blending into the environment as if it too were one of the 40,000 basalt columns emerging from the ground. The Visitors Centre has an Interactive Explorative Exhibition with multi-lingual audio guides, a Tourist Information Centre, Cafe, Gift Shop (selling souvenirs and local crafts) and Bureau de Change and has wheelchair and pushchair access. No matter how you get there, walking out onto the Giant's Causeway is a wonderful experience. This natural phenomenon creates a magical landscape of pillars, steps, paths and dramatic cliff available for you to explore. The Giant's Causeway is so fun to walk around, over and between. Wear sensible footwear, as you can spend hours soaking up the mystery, mythology and geology of these ancient surroundings. There are many events held by the National Trust, custodians of this protected area. They write an informative North Coast National Trust Blog and are active in social networking to keep you up to date with the latest opportunities for exploration at the Giant's Causeway. 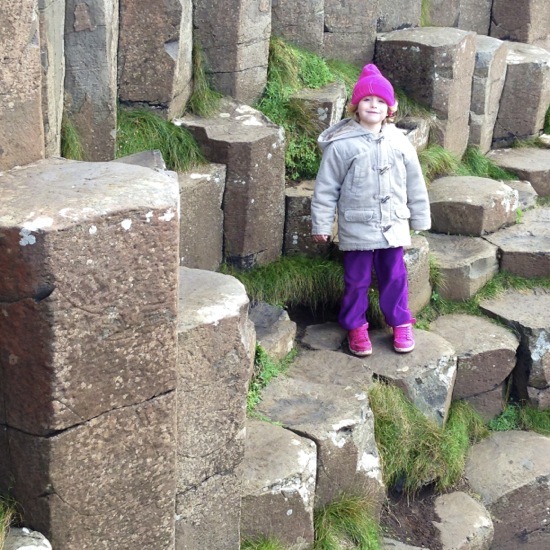 Is the Giant's Causeway for Kids? Definitely. We've taken our children here since they were very young, but we stress: BE CAREFUL. Some areas of the Giant's Causeway grow suddenly steep, and in other areas it is easy to walk out past the waterline if unaware of it. The waves can crash suddenly agains the causeway, which is beautiful to watch, but not from too close a distance. The causeway is a place you want to MAKE SURE you're supervising your children. Little ones under 5, I'd hold their hands and be with them at all times. Watch out for loose rocks, unexpected waves and sudden weather change for your safety. Be amazed, and be careful. The stones themselves are greyish-black, many patches below the waterline are deep dark black, and many at the top look like moss-filled paving stones, white and worn. As you walk out onto the Giant's Causeway, both sides fall away into the sea. Along the eastern edge is a wonderful place to sit, resting your back against the towering pillars behind you. According to local legend, this is the causeway of the giants. This is a great family destination, and gets everyone out for a nice walk along the north coast. The views during the walk to and from the Giant's Causeway are magnificent too. This IS why the coast is called the Causeway Coast, after all!